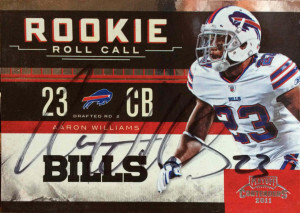 Aaron had a difficult transition his first few years there in Buffalo, but you have to hand it to the Bills and Williams being patient with finding his role in the defensive system. After a change of head coaches and defensive coordinators, it looks like Aaron will be the team’s answer at strong safety. He started 14 games in 2013 and recorded 60 tackles, 4 interceptions, 11 passes defensed, and a forced fumble. 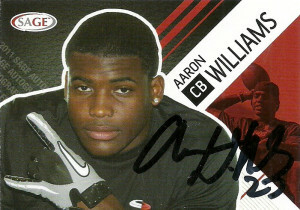 After the Bills were unable to come to a long term arrangement with free safety Jarius Byrd, the team upped its contract with Aaron instead. I had a grand plan for Ribfest this year in order to hit as many of the locations as I could. Well, other than the traffic working against me, so were the guests of honor at the event, and the Rudy’s staff. They were incredibly clueless of who was going to be at which location, and who exactly any player was. It was frustrating. Still I made my first stop at the Round Rock location and waited him out. He arrived in style in a dapper, white 4 door Porsche. 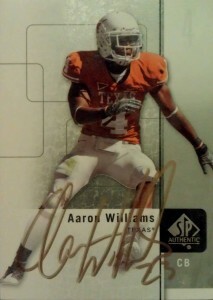 Aaron really liked his Donruss Rookies & Stars card and paused to show his friend the card before he signed. I got him shortly after on these 4 cards. The 5th was his Topps debut card, but he claimed that the photo on the card was not of him. Chris Houston who was supposed to be there with him was a last minute scratch, so I bolted for the 183 location with little time to spare for Fozzy Whittaker and a mystery guest. 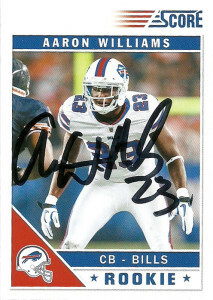 The #4 rated cornerback prospect coming into the draft, Aaron Williams was the 2nd round pick of the Buffalo Bills in 2011. Posting pretty solid numbers, Williams ran a 4.4 40 on his Pro Day, and finished his rookie season with 32 tackles, 5 pass defensed, 1 forced fumble, and 1 pick in 6 starts. 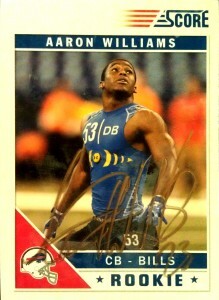 In 2012 Williams had 10 starts and notched 32 more tackles, and 7 pass defensed. 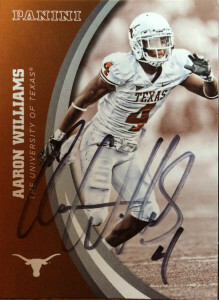 The mercurial Williams went to school locally in Austin, and then to the University of Texas in 2008. UT is frequently known in circles as ‘DB U’ because it produces more defensive backs that are NFL ready than nearly any other school in the nation. 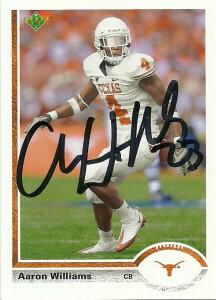 He appeared in 37 games for the Longhorns, including 23 starts at CB. 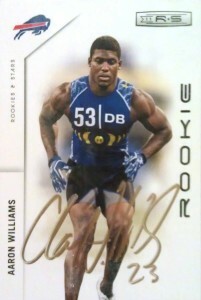 Williams was also an outstanding special teams player, known for his knack to block and return kicks. 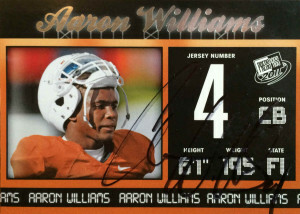 Williams recorded 106 tackles, 12 TFL, 3 sacks, 4 picks, 6 forced fumbles, and 5 blocked punts during his time at UT. He declared after his Junior season for the NFL. 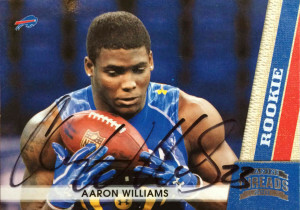 Williams, along with Keenan Robinson, and James Kirkendoll all sat at a table with me and ate lunch. 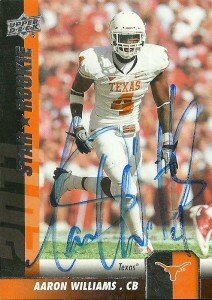 I did not realize who each was (outside of J-Kirk), but later got their autographs on their respective cards. 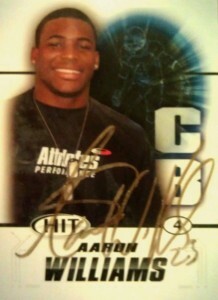 I had an extra that I let Chuck from the Zone get autographed for himself since he went to High School with Williams. Aaron is a skilled bowler and was tearing up the lanes at Highland during the LNF Bowling Tournament.